Star Wars Celebration isn't over yet. Today, Jon Favreau, Dave Filoni, Kathleen Kennedy and members of the cast took the stage in Chicago to show off the first footage from The Mandalorian, the first ever live-action Star Wars TV series, which is coming to Disney+ later this year. Sadly, the footage hasn't been officially released online just yet. However, I was lucky enough to be in the room to witness what was showcased and I will do my very best to try and explain what we saw and why every single fan of the franchise needs to get very excited starting right now. Firstly, we were shown a mesmerizing behind the scenes featurette at Star Wars Celebration. This kicked off with a long shot of Pedra Pascal's titular character, who is still just being referred to as The Mandalorian. The landscape was snowy. I only saw this footage once and it was a lot to take in, but everything looks so very tactile. Like it's very real. Even though they are using groundbreaking technology to make this show, it feels like everything was actually built from scratch. There were amazing landscapes filled with scum and villainy, ala Mos Eisley in A New Hope. Countless practical creatures and aliens. Costumes that feel totally authentic to the franchise. All of the behind the scenes stuff of them actually filming was tremendous. All of the directors, including Taika Waititi and Dave Filoni, who makes his live-action directorial debut, can be seen guiding the actors on amazing sets that are again, very real. The movies of the Disney era have done a great job of trying to keep practical effects a thing, but this feels the most practical and touchable of anything so far that the Mouse House has done. I can't emphasize that enough. The creatures, the costumes, the locations. It all feels impossibly real. It's especially tough to capture what was shown in this featurette, but let's talk about the actual footage. We were shown roughly ten full minutes of a scene and something that resembled a teaser trailer. 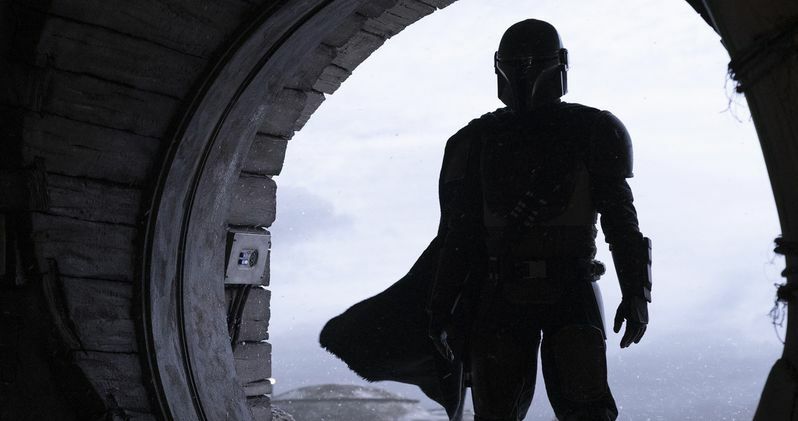 The scene kicks off with The Mandalorian, decked out in his starkly colored armor, walking into a cantina which was, again, very reminiscent of Mos Eisley. There are tons of alien creatures and droids scattered about. He then takes a seat at a table with Carl Weathers' character, who we now know to be named Greef Carga. He runs a group of bounty hunters and he is offering Pascal's character a very secretive and very lucrative job. There are several pucks on the table that represent jobs and work as a form of currency for these jobs. However, the contract Greef is offering to our protagonist is off the books and doesn't come with a puck. It requires a face-to-face meeting. The Mandalorian then takes a walk through the streets, which gives us a great sense of the environment. We see a shot of a Kowakian, aka the species that Salacious Crumb is associated with, roasting on a spit. It's a practical puppet. Everything looks practical. There are again, tons of droids and aliens littering the streets of this seedy town, with tight buildings and alleyways everywhere. Eventually, Pascal's character, who never takes his helmet off for the whole thing, comes to a door that leads him down a corridor where, surprisingly, he's met by a group of Stormtroopers. The hallway and room lighting reek of Star Wars. We then see a very fancy space desk in the center of the room where none other than Werner Herzog (whose character name we still don't know) is sitting. He welcomes this bounty hunter in with his signature, intense voice. He's clearly leading this outfit, though his affiliation isn't totally known. Is he working for the remains of the Empire? Herzog's character says he was told that Pascal's character was the best bounty hunter around. A second later, a man, a mysterious doctor character, walks in and The Mandalorian raises his pistol and his rifle, the one that was previously released online that resembles the one from the Boba Fett cartoon from the Star Wars Holiday special. It's very tense. Herzog reminds him that he's outnumbered four-to-one. His response is very telling and very classic to the franchise. Everyone then lowers their weapons and he sits down so the two can have a chat about this job. Werner Herzog then hands him a large piece of metal called beskar, which is clearly very valuable as a down payment of sorts. He promises there's much more, assuming the job is completed. Herzog reveals that the deal is to bring back this mysterious bounty alive. However, for a lower payment, he can bring back proof of death. The doctor character then interrupts, saying that's not what they agreed upon. Herzog then says he's just being "pragmatic." The deal is then worked out. Herzog doesn't give The Mandalorian much to work with, just four digits of an eight-digit code and a tracking FOB. This information dates back 50 years. We then see the Lucasfilm logo and what closely resembles a teaser trailer begins. The Mandalorian's ship, called the Razorcrest, is seen flying over the sky. We cut to another cantina where we get a glimpse of Gina Carano's character, named Cara Dune, a former shock trooper. The two get into a scrape and action upon action breaks out. We then cut to Giancarlo Esposito (of Breaking Bad fame) who is clearly working for the remnants of the Empire. He's surrounding by Stormtroopers. He then says "burn them out" before a Stormtrooper with a massive flamethrower begins burning up a building. There are tons of dead Stormtroopers. We then cut to a huge fight that features IG-88 in action and, while it's tough to describe, all of the legends that have been built up about this killer bounty hunter droid over the years have been warranted. He is lethal. He's spinning around wildly and firing at buildings, with The Mandalorian taking cover trying not to get killed. We then see a shot of a character who appears to be played by Bill Burr, with two blasters in hand, decked out in black. There's a very cool shot of Giancarlo's character flying a Tie Fighter, causing plenty of problems. We then get what might be argued as the money shot, with The Mandalorian cracking a Stormtrooper in the face, causing his helmet to crumble. It's like nothing we've ever seen in the franchise. He then picks up his rifle before we cut to the title card. The whole time, Werner Herzog is providing narration that seems to doubt as to whether or not the galaxy is better off now that the Empire has been defeated. We also saw some random shots of Greef thrown in there. Lots of amazing landscapes. Tons of explosions and action. It was so much to process. IT also looks like Disney dropped an unbelievable amount of money on this thing. Based on what we saw, I feel confident in saying that Lucasfilm is about to deliver something capable of uniting the entire fanbase. You're not ready for what's coming, Star Wars fans.